"One cannot develop taste from what is of average quality but only from the very best." n any desert environment, resources are scarce and precious. This is especially true in Arizona, and Scottsdale, one of the fastest-growing cities in the United States. Avoiding development of inappropriate sites and reduce the environmental impact from the location of a building. Limiting disturbance including earthwork and clearing of vegetation to within 20 feet of building footprint. Minimize heat absorption, use systems that reduce heat and glare. Use of at least one water conservation measure. Use rapidly renewable building materials and products. Mike and Charlie Frat were early adopters of these new standards. In fact, they were already taking environmentally-sensitive and energy-saving precautions when the program was announced. Building high-end luxury custom homes demands the very best in materials and labor, and the Frats have found a harmonious balance between the high expectations of their clients and the needs of the environment into which their new homes are added. When building a new home, Mike and Charlie endeavor to minimize the impact the new home will have on it's surroundings and always design with a vision that complements, rather than changes, the surroundings. 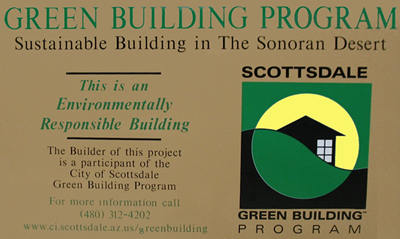 As required by the Green Building Program, there is very limited disturbance to the area around the building site. They use many energy and water conservation features such as insulated block, desert landscaping and energy-efficient appliances. As environmental technologies develop, Mike and Charlie Frat continue to improve and update their methods, setting new goals with each new project and helping do their part to preserve the environment.